ROCHESTER, Minn. — A new master’s degree program for physician assistants (PA) at Mayo Clinic has received initial accreditation approval from the Higher Learning Commission. Mayo Clinic School of Health Sciences' PA Program will feature transformational education, using strategies for the next generation of learners, such as problem-solving skills in small group and other hybrid learning activities. The 24-month program leads to a Master of Health Sciences in physician assistant studies. Included in the program are courses and labs held at the expanding Cascade Meadow facility in Rochester for Saint Mary’s University of Minnesota and hands-on clinical experiences at Mayo Clinic. The second year of the curriculum is dedicated to clinical rotations at Mayo Clinic’s hospitals and clinics in southern Minnesota, western Wisconsin, and northern Iowa. To support drawing local residents who are committed to serving Mayo Clinic Health System, Mayo Clinic School of Health Sciences has collaborated with Saint Mary’s University of Minnesota and the University of Minnesota Rochester to offer a "3+2" accelerated master’s degree model. Learners selected for this track will complete their first three years of undergraduate schooling at Saint Mary’s University of Minnesota or University of Minnesota Rochester, and complete their final two years of graduate school coursework with Mayo Clinic School of Health Sciences. This track is in addition to the master's degree track. “Innovative educational collaborations will play an essential role in creating the highest-quality, patient-centered care,” says Fredric Meyer, M.D., executive dean of education, Mayo Clinic. “We are committed to developing educational pathways for students that empower them to meet the needs of area patients.” Dr. Meyer is the Juanita Kious Waugh Executive Dean for Education. The "3+2" course of study will start the first 24-student cohort at the collaborating universities in fall 2019 for applications received by Dec. 7. A new cohort will be jointly selected for freshman admission each year. The PA Program's first class is anticipated to begin in fall 2020, pending approval by the Accreditation Review Commission on Education for the Physician Assistant. Applications for the two-year master’s degree PA Program will be open April to October 2019 for the class beginning in August 2020. Physician assistants are a growing part of the medical workforce. By 2025, a shortage of 124,000 primary care physicians is anticipated, with a high percentage in rural areas. PAs are expected to play a pivotal role in primary patient care as health care evolves. The Bureau of Labor Statistics reflects this data, as their predictive models anticipate 37 percent job growth for physician assistants by 2026 ─ the fifth-fastest-growing health care profession over the next decade. Mayo Clinic's PA Program will emphasize the role of PAs in rural health care settings, so that PA graduates may ease the lack of available medical care in rural environments. While 20 percent of the American population lives in rural areas, only 10 percent of doctors practice in these areas. Only 4 percent of family medicine training occurs in these areas, further exacerbating the rural health care issue. Currently, 1 in 7 PAs work in rural settings, helping to alleviate this issue by providing direct medical care as part of a closely coordinated care team with physicians. "This collaborative approach to addressing Minnesota’s critical health care workforce demands is a wonderful example of local institutions working together for collective impact. Such partnerships are essential to the future of education,” says Lori Carrell, Ph.D., chancellor, University of Minnesota Rochester. “With the University of Minnesota Rochester’s innovative approach to undergraduate education, students are able to use their senior year as a clear path into many high-demand health care careers. With this partnership, we’re thrilled to provide one more efficient connection between education and industry." Saint Mary’s University of Minnesota awakens, nurtures and empowers learners to ethical lives of leadership and service. At Saint Mary’s University of Minnesota, students find in every classroom — whether in person or online — a relationship-driven, person-centered education. Through intense inquiry, students discover the truths in the world and the character within. Founded in 1912 and accredited by the Higher Learning Commission, Saint Mary’s University of Minnesota enrolls 5,800 students at its residential undergraduate college in Winona and its Schools of Graduate and Professional Programs based in Minneapolis but extending worldwide. Saint Mary’s University of Minnesota offers respected and affordable programs in a variety of areas leading to bachelor’s, master’s and doctoral degrees, as well as certificates and specialist designations. Learn more on the Saint Mary’s University of Minnesota website. The University of Minnesota Rochester promotes learning and development through personalized education in a technology-enhanced environment. The University of Minnesota Rochester empowers undergraduate and graduate students to be responsible for their own learning and provides appropriate support to prepare them to succeed in a global and multicultural society. The University of Minnesota Rochester serves as a conduit and catalyst for leveraging intellectual and economic resources in Rochester and southeastern Minnesota through its signature academic, research and public engagement programs in collaboration with other campuses of the University of Minnesota, other higher education institutions throughout the state and nation, governmental and nonprofit organizations, and private enterprise. 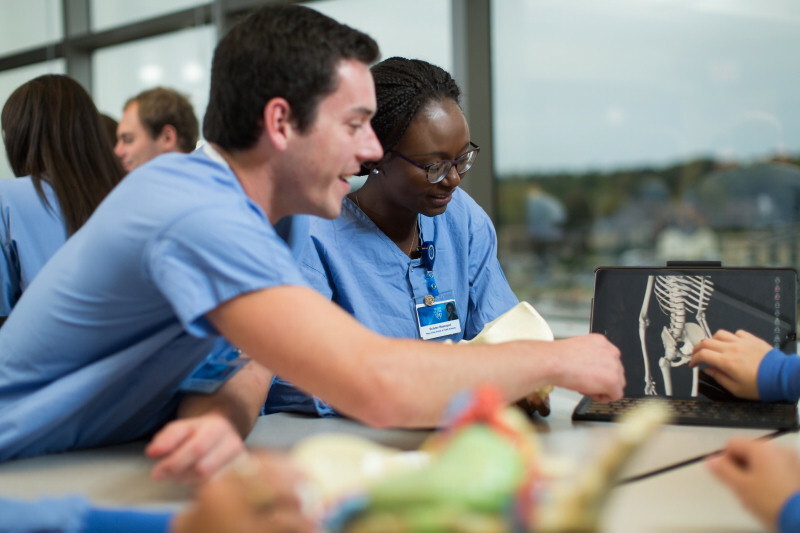 Each year, nearly 1,700 students enroll in more than 130 Mayo Clinic School of Health Sciences allied health programs representing 55 health sciences careers. With a low student-to-faculty ratio, every student benefits from world-class instructors, innovative educational methodologies and extensive individualized state-of-the-art training at Mayo Clinic, a premiere academic medical organization. Mayo Clinic School of Health Sciences is one of five premiere schools of medical education within Mayo Clinic College of Medicine and Science.